With „The Last Olympian“, the fifth and final installment of the „Percy Jackson & the Olympians“ series, Rick Riordan’s story about the demigod boy Percy Jackson and his campaign against the Titans is coming to an end – and to be honest I’m relieved that it was the last book in this series. I’ve always enjoyed reading the Percy Jackson books and initially planned to binge-read the books when I got the box set but I often had the feeling that I started this series much too late because I think being in my late twenties now I’ve already outgrown the series. I know it’s unfair to compare the Percy Jackson books to young adult series like Harry Potter or The Hunger Games because every series is a universe on its own but while I think I’m never going to be too old to reread both these series with the same fascination as the first time I really can’t imagine ever rereading a Percy Jackson book because I feel like I’m simply too old for them. I always find it hard to review the books in this series because essentially I think Rick Riordan has done an amazing job creating this world full of gods, demigods, monsters and other creatures from the Greek mythology and bringing these ancient elements to our modern world. I also think that every book on its own has a great and very entertaining story with lots of action, humor and fun but when I take a look at the series as a whole I have to state that in my personal opinion there isn’t a lot of development either of the story or of the characters. Since the second book I always had the feeling that I’m living through the same story over and over again just with some different gods/monsters and in some different places – which I can’t really blame Rick Riordan for because the concept is still great and I’m sure that this is exactly what his target group expects from the books and his fans probably wouldn’t mind if the series would have gone on like this and never ended. So I kinda expected the same experience with „The Last Olympian“ but I have to give Riordan credit that this book indeed is a bit different and that you can feel right from the start that it’s steering towards the ending of this whole big story. Now here comes my problem with this final book: Though I really liked the books and never had any difficulties sympathizing with characters like Percy Jackson, Annabeth Chase, Grover Underwood or Percy’s Cyclops half-brother Tyson I never really succeeded in bonding with these characters so that I often caught myself not really caring about their fates – which isn’t the best premise for suffering vicariously with them in their final battle against the Titans. This means that for example the mysterious „Great Prophecy“ that Rick Riordan set up a while ago and that predicted a probable bad ending for Percy himself didn’t really work for me – that would never have happened with the famous „neither can live while the other one survives“ prophecy concerning Harry Potter and Lord Voldemort (I know I’m being unfair again, but still…). 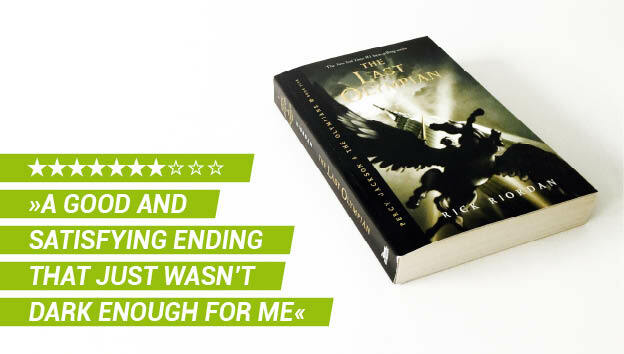 I just never got sucked into Percy Jackson’s world in such an intense way as it happened with other young-adult series and I’m having a bit of a bad conscience for criticizing Rick Riordan for this because as I said before I’m sure that the series serves its purpose and an average Goodreads rating of 4.48 stars for „The Last Olympian“ kinda speaks for itself but to me the Percy Jackson series never left the status of „just“ being a children’s book behind so that I’m glad that I’ve reached the end of this story and I’m not sure if I will ever give one of Rick Riordan’s other series a try. I’m satisfied with the ending as it is because I think overall it’s a good ending that answers all the pressing questions that were raised over the previous books but for me it simply wasn’t dark and grown-up enough. 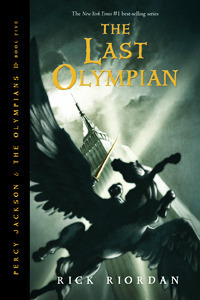 Rick Riordan's "The Last Olympian" provides a good and mostly satisfying ending to the "Percy Jackson and the Olympians" series but unfortunately I had the same problem with this final installment as with the previous books: for my personal taste the series lacked some overall (character) development and compared to other similar YA series it just felt too much like a children's book to me – but to be fair, I don't think I'm still in the target group of these books.